Take one of the finest British traditions, combine it with champagne and give it a Scandinavian touch – and you have d’Angleterre’s luxurious Afternoon Tea. In cooperation with KRUG Champagne, d’Angleterre has reinterpreted the classic English Afternoon Tea and it is served in the beautiful Gallery Hall with high ceilings and imposing chandeliers. Untraditional and eclectic specialties are featured by our Michelin restaurant Marchal, and specially composed tea is served to complement the taste of Champagne. Using the finest china ‘Emperor’s Garden’ from Fürstenberg, our team of attentive wait staff is on hand to make sure your Afternoon Tea at d’Angleterre will be unforgettable. Here you can view our Afternoon Tea photo gallery. Krug Afternoon Tea is served every Sunday from 3pm to 5pm. Prices start from DKK 645,00 per person. 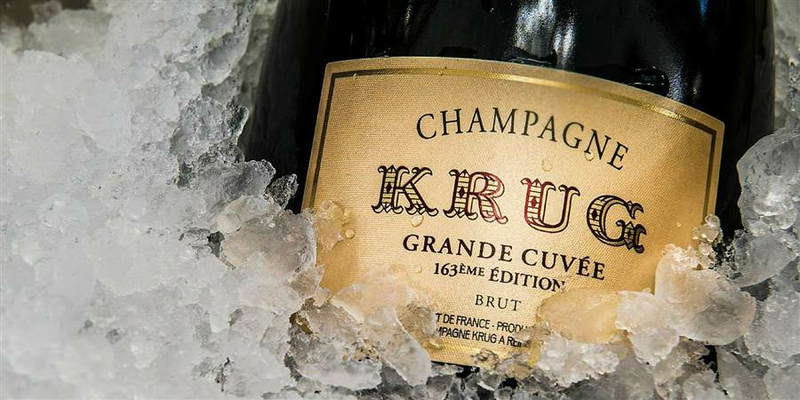 We gladly welcome bigger groups of five guests or more to Krug Afternoon Tea every Sunday. Please contact m.grandt@dangleterre.com for reservation. It is possible to book up to 24 guests in one reservation. Krug Afternoon Tea is also offered to private groups all weekdays on request. The number of a private group is a minimum of 12 and a maximum 24 guests.